PROVIDENCE, R.I. - Conor O'Neil scored what proved to be the game-winning goal with just 3:31 to play as the University of Vermont captured a 3-1 win over the No. 9 Providence College men's hockey team on Friday night at Schneider Arena. Schneider Arena - Providence, R.I.
- The Friars held a 10-5 advantage in shots after a scoreless first period. 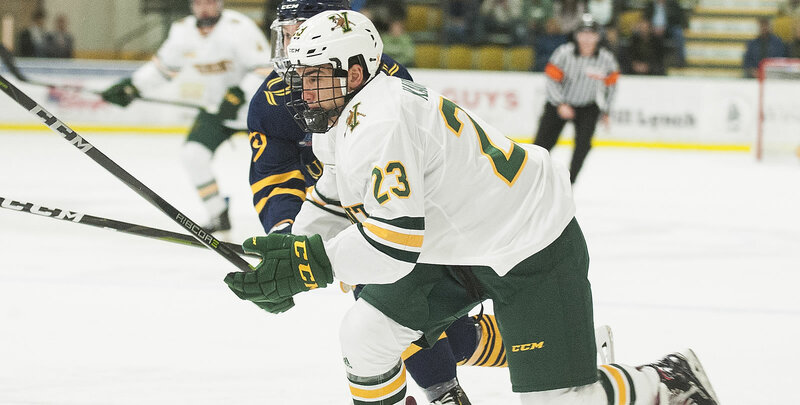 - The Catamounts struck first early in the second period as Max Kaufman cashed in just 11 seconds into the man-advantage to make it 1-0. - Hawkey had to be sharp as he robbed Vlad Dzhioshvili with a sprawling save at the doorstep minutes later. - The Friars were finally able to sneak one past Lekkas at 13:33 of the second period on Vincent Desharnais' third goal of the season and second in as many games. Scott Conway and Brandon Duhaime were credited with the assists on the play. - Providence nearly grabbed the lead shorthanded as Matt Koopman's breakaway bid was denied by Lekkas, despite drawing a slashing call on the play. - Lekkas continued his success against the Friars in his career as he turned away all 13 shots he faced in the third period, including six shots over two Friar power plays in the final 20 minutes. - Conor O'Neil's one-timer with 3:31 proved to be the game-winner as Derek Lodermeier added an insurance marker with 2:07 remaining in regulation. - The Friars fall to 5-3-2 on home ice this season and are now winless in the last three games against the Catamounts (0-2-1). 1-0 (UVM) - 1:40/2nd - PP - Max Kaufman (O'Donnell, Evers) - Snap shot from the right circle through a screen and off the post. 1-1 (PC) - 13:33/2nd - EV - Vincent Desharnais (Conway, Duhaime) - Shot from the point through a screen in front. 2-1 (UVM) - 16:29/3rd - EV - Conor O'Neil (Misley) - One-timer off a centering pass. 3-1 (UVM) - 17:53/3rd - EV - Derek Lodermeier (Kaufman) - Shot from the slot that broke under the arm of Hawkey. The Friars and Catamounts will conclude their season series tomorrow night at Schneider Arena on NBC Sports Boston.